The Food-Minded Mama: Flan, Yummy Flan!! Cinco de Mayo = friends and good Mexican food. Lorelei and I had a bunch of friends over and some (decent) take out Mexican food. I must say though, at least for me, the highlight of the evening was the desert. 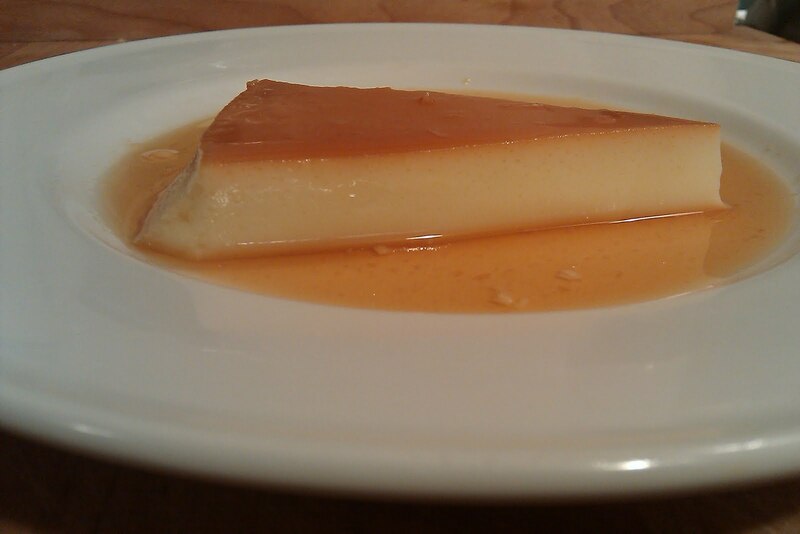 Flan. 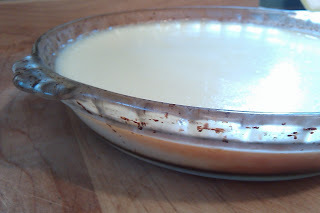 I have dreamed about this flan for years and have never made it myself. The recipe is that of my ex-fiance's mom. I have always remembered it as being silken, not overly sweet, delicate, and a dish to be contended with. I have never, not once, found another flan that has measured up to this recipe and tonight I proved my memory to serve me well. The ingredients? Technically, 3. With water, vanilla extract, and a almond extract, 6. I thought it was too simple and tried to make it 'the way I thought it should be'... colossal failure. Do it this way and you won't fail. Out of the oven it doesn't look like much, but let it set up, you'll get your prize! If only I had a big enough flat plate.. but it still looks good, huh? Set out a large 2" deep roasting pan and fill with 1.5" (or so, err on the side of less) of water*. Add your vanilla and almond extracts and give the whole thing a good whisk to combine the ingredients. Through a fine sieve, pour the mixture into the pie dish/ramekins then place the roasting pan into the middle of the oven for 30 minutes. ** Check it after 20 minutes. My ex's mom's recipe called for the baking time to be 20 minutes, but my oven I'm pretty sure is callebrated differently. The flan will be ready to take out of the oven when there is a good wiggle, not a wave when you give it a shake. When you remove it from the oven, take it out of the bain marie and place it on a hot pad/cooling rack to to cool for at least 30 minutes. Then, cover it with plastic wrap and place it in your fridge for at least 24 hours. When you are ready to serve, run a knife around the edge and place an inverted plate on the pie dish. 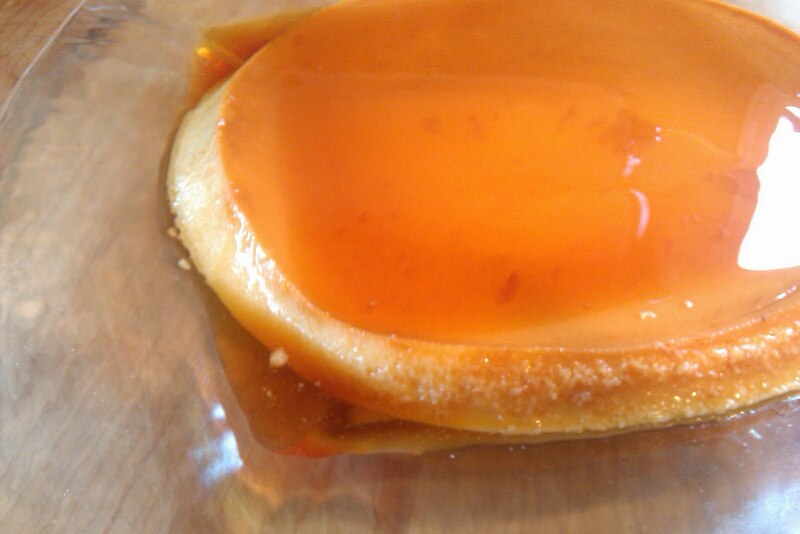 Quickly, but gently, flip the flan onto your place. CAUTION, the sugar is liquid and can pour out so hold the plate firmly to the pie dish so you don't lose any of that goodness. Slice and serve my friends. I hope you will enjoy it as much as I have.